The regeneration of Glasgow’s historic riverside is a key strategic aim of the City’s officials and Scottish Enterprise. Pacific Quay comprises the former Plantation Quay and Princes’ Dock; and is an area that is at the heart of regeneration to form a new cultural and creative quarter with a range of different uses including retail, leisure and residential, as well as core offices and workspaces. The regeneration of Glasgow’s historic riverside is a key strategic aim of the City’s officials and Scottish Enterprise. Paci c Quay comprises the former Plantation Quay and Princes’ Dock; and is an area that is at the heart of regeneration to form a new cultural and creative quarter with a range of different uses including retail, leisure and residential, as well as core offices and workspaces. 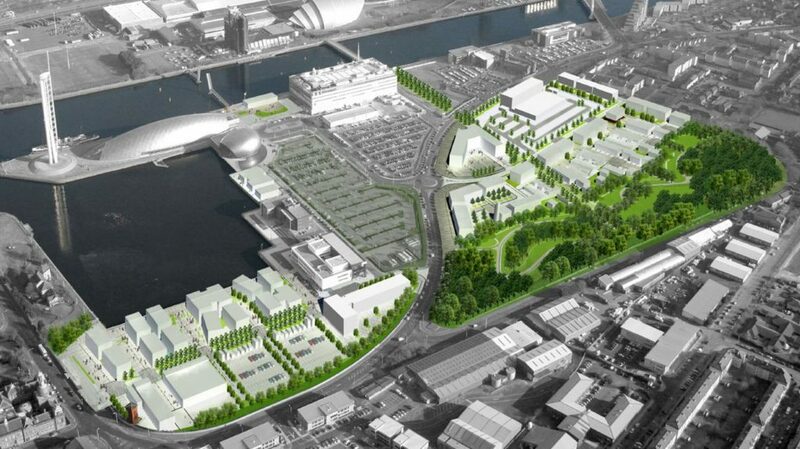 Woolgar Hunter has been involved with the Pacific Quay project for a number of years; helping to implement the masterplan proposals to design and implement a strategic spine road and drainage system as well as undertaking geo- environmental appraisals of individual development plots. Our input has continued in the provision of technical advice to Scottish Enterprise during negotiations for the sale of plots. The area is complex in engineering terms, with the old quay walls remaining and deep made ground proven in the in filled basins. The interplay between the riverside soils, deep made ground and quay walls has been assessed and development constraints plans produced. With ever-rising waste disposal costs, the formation of strategies for waste soil minimisation has been key to assessing the area. Creation of pragmatic and deliverable drainage strategies has been another pertinent issue in the area, with the combination of a high and tidal water table with silty alluvial soils requiring particular consideration.